The quest to find the Ark of the Covenant has enduring appeal and over the ages has inspired holy men, knights, adventurers, artists, novelists and lately filmmakers. The ark and the items associated with it - Aaron's staff, the jar of manna and the tablets of the testimony - were considered sacred, the only material objects considered to be so by the Israelites, and were originally kept within the Most Holy Place of the Tabernacle, the portable tent used by the ancient Israelites for worship. The current wherabouts of the physical ark, should it exist, may currently be unknown, but it has a cryptic counterpart, to which I was led over many years and part of which I have already revealed within the NIV Bible. On the atonement cover of the ark the cherubim of the glory faced each other and between them was the space where the Glory of the Lord was thought to be physically present. The presence of the Glory within the Most Holy Place meant that the Israelites were forbidden to enter it because of their sins, with the exception of the High Priest on the Day of Atonement, who was permitted to approach the Ark to perform the atonement rite over its cover. The holiness of the ark was symbolised by the use of gold for the manufacture of the atonement cover and for the overlay and lining of the ark, in this context the precious metal symbolising excellence and enduring value. The ark's function as the presumed sole location of the physical presence of the Lord suggests that it was a conduit to and from a heavenly dimension, through which the Lord manifested here on earth. Here I will show that the biblical measurents of the ark, the gold used in its construction and its location and design, supported by the proportions of the vesica piscis, the geometry of the tesseract and some apposite gematria, work together to suggest this higher dimension of being. They also confirm that Jesus Christ, our atonement cover, is the door through which we enter it. The biblical ark was a hollow chest and measured 1.5 by 1.5 by 2.5 cubits . It can therefore be modelled as a hollow cuboid of side 1.5 and 2.5 units. The ratio of the side, depth and length in whole numbers is 3:3:5, which is important in what is to come. The perfect number three represents the Trinity and things spiritual; five represents God's grace and divine approval. 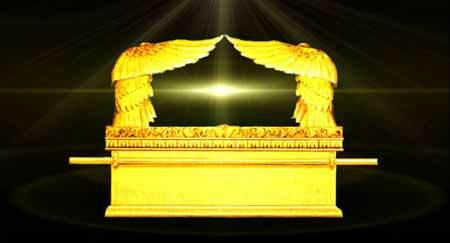 The ark was the only object contained within the Most Holy Place of the tabernacle. The Most Holy Place was essentially a hollow cube, externally 10 cubits on a side. The image of the hollow cuboid sitting within a hollow cube is reminiscent of the four-dimensional analogue of the cube, known as the tesseract. Being a four-dimensional object the tesseract cannot be illustrated, but the three-dimensional 'shadow' it projects into 3D space can be shown. A wireframe model of one of these projections is illustrated (in 2D!) below, along with the Most Holy Place for comparison. This is the simplest of a tesseract's possible 3D projections, familiar to anyone with an interest in mathematics. The fourth dimension is hinted at by the cube sitting within the 3D shadow, connected by lines to the outer corners. The ark within the Most Holy Place represents this inner cube and therefore also hints at the fourth dimension. As the High Priest approached the ark on the Day of Atonement he was metaphorically, and perhaps literally, walking into another dimension. The Bible itself arguably points to a fourth dimension in passages such as Ephesians 3.18: ". . . may have power, together with all the saints, to grasp how wide and long and high and deep is the love of Christ, . . . " If the four adjectives each describe a dimension then "deep" may be a reference to a fourth dimension of space. Other passages, such as Jesus evading troublesome crowds , and Enoch disappearing from the earth after walking with God  suggest the possibility of another accessible spatial dimension. Let us now add a dimension to the ark and see what transpires. I modelled the ark as a hollow cuboid. If we increase this by one dimension, taking the ratio 3:3:5 as our guide, and increasing it to 3:3:3:5, we have a hollow tesseractoid (my presumed name for the figure), the 4D analogy of a 3D cuboid. A wireframe model of the 3D shadow of this figure is illustrated below. The volume of this 3D cross, formed from the eight cells of the hollow tesseractoid, is (1.5 x 1.5 x 1.5 x 2) + (1.5 x 1.5 x 2.5 x 6) = 40.5 cubic cubits. This is equal in volume to a solid cuboid with dimensions 3 x 3 x 4.5, the product of which is also 40.5 cubic cubits. If we double the lengths of the sides to give the whole number ratios 6, 6 and 9 we have a solid cuboid with volume 324 cubic cubits. I have shown this as a figure composed of discrete units. Remarkably, the number 324 is the gematria of the English words 'the ark'! Is this stunning link an indicator we are to regard this object as a kind of ark too? Bearing that in mind, let us continue. Returning to the smaller cuboid of dimensions 3 x 3 x 4.5, we now reduce the scale of this cuboid to conform to that of the original ark dimensions, we have an object of dimensions 1.5 x 1.5 x 2.25 cubits. The volume of the cuboid is 1.5 x 1.5 x 2.25 = 5.0625 cubic cubits. Incredibly, this is numerically equal to a perfect tesseract of side 1.5 cubits! The volume of the tesseract is 1.5 x 1.5 x 1.5 x 1.5 = 5.0625 quartic cubits. This hollow tesseract unfolds to form a 3D cross with a volume of 27 cubic cubits. 27 is the cube of 3, the perfect number symbolising the Trinity and spirit, the cube itself being the most holy object to the Israelites.. 27 is also the reduced value of 'the ark'. The Ark's biblical dimensions of 1.5, 1.5 and 2.5 are the only numbers I'm aware of that will lead to this transformation from biblical ark to tesseract, via the 3D cross. It could be seen as a metaphor for the Christian message of salvation through the cross, which 'opens the door' to heaven (which I am equating here with the fourth dimension). which itself is numerically equal to a cube of side 1.5 cubits. The proportions of this hidden atonement cover are 3 to 2, which means it will circumscribe the beautiful figure known as the vesica piscis, which I have already discussed here. Intriguingly, the central vesica is shaped like an almond nut, and an almond branch was the original staff kept within the ark. In Christian art an aureola in the shape of a vesica, called a mandorla (Italian for 'almond nut') is often used to frame depictions of Jesus or the Virgin Mary. I found that if we start with circles of 1000 square units each (unity x 1000 to give whole numbers), then the areas of the vesica itself and the entire vesica piscis are embodied in the gematria of the Holy Mother and her Son. So the vesica piscis symbolises the Virgin giving birth to the Holy Child! Note that the likely volume of the Most Holy Place within the Tabernacle was 1000 cubic cubits. The concept of the Most Holy Place as a womb is found in my page on the male child. The vesica rests on the centre of the atonement cover, where the Glory of the Lord was made manifest. Note the two crescents either side of the central vesica, which sit where the Cherubim of the Glory sat on the cover. Here is an image of the atonement cover for comparision. Note the similarity between the crescents and the spread wings of the cherubim. I propose that the cherubim on the atonement cover of the ark were designed to represent the crescent shapes in the vesica piscis, and that the Glory of the Lord is therefore symbolised by the vesica. As we just saw the vesica has long been linked to Jesus through Christian art - and as we just saw it is now identified with his Hebrew name through gematria! The New Bible Code identifies the location of the Ark of the Testimony with an elegant encoding by the ELS method. Encrypted within the same portion of text by gematria is the Ark, the atonement cover and the cherubim, at odds of 1 in 90000 against. Note that the ELS encoding is totally unrelated to the gematria-based encodings and therefore independently validates them. And right alongside these beautiful encodings are those of the vesica piscis and its component parts, represented by the cherubim and the sacred space between them. Remember that these are based on a circle with an area of unity x 1000 (to give whole numbers), 1000 being the probable volume in cubic cubits of the Most Holy Place in the tabernacle! So the gematria of 'gold' in Hebrew is reflected in its atomic structure. I showed above that the dimensions of the '4D ark' (remember gold was lavishly employed in the construction of the original 3D ark) have ratios 3, 3, 3, 5. These numbers sum to 14. Apart from its rarity, gold is valued for its characteristic reddish-yellow colour, its density and its unreactivity and consequent resistance to tarnishing. These are all either solely or partly due to relativistic effects. Gold's high atomic number of 79 means that the electrons in its shells (using the Bohr 'solar system' model) spin at more than half the speed of light and, according to special relativity, increase in mass, flatten in the direction of movement and experience a slowing of time. The increase in mass leads to relativistic contraction of the electron shell and an increase in density. Gold's absorption of light is also affected, giving its characteristic yellow colour, as distinct from the silvery-gray colour of nearly every other metal. The unreactivity of gold is caused by the outermost electron hiding more deeply within the shell, also due to this contraction. According to special relativity, massive objects bend space and time to create gravity, therefore since gold is particularly dense it will cause a greater bending of space and time than nearly all other materials. In general relativity, the concepts of space and time are replaced by one deeper, four-dimensional reality (the subject of much scientific debate). I believe that the relativistic effects on gold have made it the ideal material to represent an extra, hidden dimension. Gold is often used in the Bible to point to things beyond the material, and I believe that the prevalence of gold in the Ark of the Testimony was always meant to point to this hidden dimension of the ark. As I was working on this webpage I checked the first few verses of the NIV Bible, where ARK OF THE TESTIMONY and the area of the vesica piscis are encoded, to see if there was any hint of a fourth dimension to the ark. Here is what I found. The word string sits virtually square in the centre of the longer Ark of the Testimony string. FOUR-DIMENSIONAL ARK is an alternative interpretation of 925, which can also be interpreted as JESUS CHRIST, our atonement cover! What he found was that if the 28 letters of Genesis 1.1 in the original Hebrew were converted into their reduced (qatan) values and arranged in a 7 by 4 table, encrypted information was revealed. Running down the centre of this table is 3, 3, 3, 5. The Hebrew word for three, shalowsh, uses the letters Shem, Lamed, Shem and Hey, with standard values of 300, 30, 300 and 5. The reduced values, however, are 3, 3, 3 and 5, which suggests the 3 x 3 x 5 ratio of the ark dimensions, but with a fourth dimension added! The table has many interesting features, many of which have been tabulated by the author. One of them is pattern of arcs either side of the centre. These arcs are composed of strings or part-strings of the same number, and are the 1111 and 4441 to the left and 1144 and 2211 to the right. The author identifies these as the pattern for the wings of the cherubim on the atonement cover. Note there are two curves either side. These are an even better fit for the outlines of the crescents either side of the vesica! The central vesica is also perfectly indicated and encloses the four central numbers from the letters of shalowsh (three). The obvious signs that this table is to be regarded as the atonement cover for an ark also indicate that the 3, 3, 3, 5 running down its centre, where the Glory of the Lord resided, point to a hidden, fourth dimension. 2. The possible exception is the altar of incense, which only Hebrews 9.4 describes as being within the Most Holy Place. It was next to the veil between the Most Holy Place and the Holy Place and so arguably could be considered to be within the Most Holy Place when the veil was parted. 5. The 3D cross made by unfolding a tesseract was made famous in Dali's painting Crucifixion (Corpus Hypercubus). It is one of 261 possible configurations, or nets. 6. The dimensions of 6, 6 and 9 are the digits of the ordinal value of Matthew 1.1 (NIV), 669. This begins the New Testament and the account of the genealogy of Jesus Christ, and therefore is of similar import to Genesis 1.1. 7. It contains a smaller cuboid inside, which can be lifted out to leave a box made from 212 units and which is closer to the real ark than the hollow cube I originally modelled it as, since the sides have some thickness, rather than being infinitely thin, as in a hollow cube. The cuboid inside is composed of 112 units. 112 is the standard value of the Hebrew name YHVH Elohim (the Lord God). The inner cuboid is equivalent to the sacred objects inside the ark: the staff, manna and tablets, which I have already revealed as symbolising the male child of Revelation 12. But for space considerations I would have put this information in the main page. 8. The outer shell of that cube is 26 cubic cubits, the standard value of 'YHVH' in Hebrew and the ordinal value of 'God'. As with the previous note, space considerations stopped me putting this information on the main page. 10. Note that the number 391 is encoded six times within the first 37 words, covered by the encoding of 'Ark of the Testimony'. I have shown only the first encoding. 11. I have tried to contact the author, without result. The page is here. 12. Two patterns I noticed are, firstly, the number 541 proceeding from each instance of 5 in the table. This is the gematria of Yisrael (Israel) in Hebrew and, aptly, is the 10th hexagram number, from which a Star of David can be made. The other pattern is the triangular numbers 351 (the 26th) and 435 (the 29th) proceeding from or passing through the central threes. Notice that the order numbers here, 26 and 29, are also implied by the corner numbers. These multiply to give 754, the standard value of the Hebrew words Yehoshua HaMashiach - Jesus the Messiah!